Nodding Syndrome: A Devastating Medical Mystery In Uganda : Parallels The strange disease known as nodding syndrome affects only children, and only in parts of East Africa. The illness begins with nodding of the head and ends with massive physical and cognitive deterioration; its cause has eluded epidemiologists. 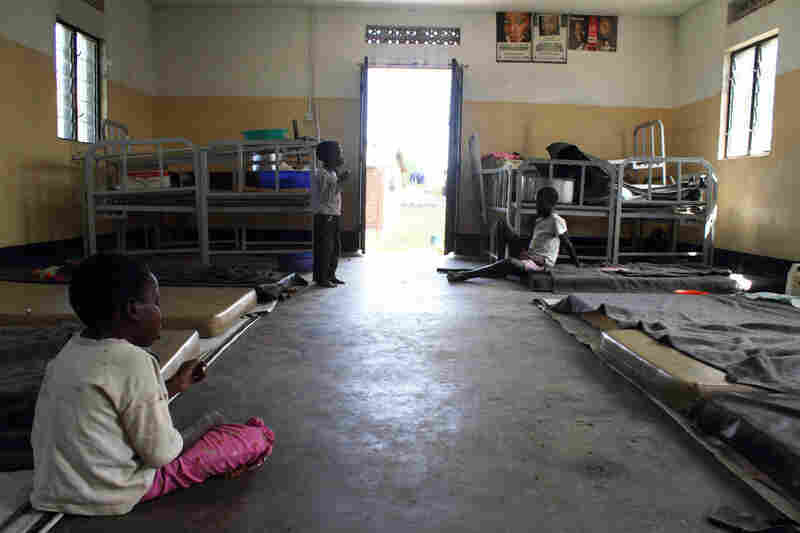 Treating 3,000 affected children has been left to Ugandans. Most of the children in the nodding syndrome ward at the Atanga Health Center in the Pader district in Uganda are severe cases, who first showed symptoms as early as 2002, or children who have been neglected by their parents. Staffers here treat these patients with a generic anti-convulsant drug called sodium valproate. They also provide the children and their caretakers with food. The staff has not yet diagnosed Gloria, 9, but believes she has what they refer to as nodding-plus — meaning she has symptoms of nodding syndrome, as well as more common epileptic seizures. The Atanga Health Center is the only facility in Pader district with a nodding syndrome ward. Currently, there are slightly more than 1,000 children spread across thousands of miles in Pader who have been diagnosed with the syndrome. Two children who have nodding syndrome eat a meal at Atanga. A nodding syndrome response team member collects notebooks that contain patient histories at an outreach site in Pader district. These notebooks contain team members' notes from their once-a-month consultations with parents of affected children, as well as prescribed treatments, such as dosages of anti-convulsants and nutritional supplements. A child with nodding syndrome waits for treatment at an nodding syndrome outreach site in Pader district. 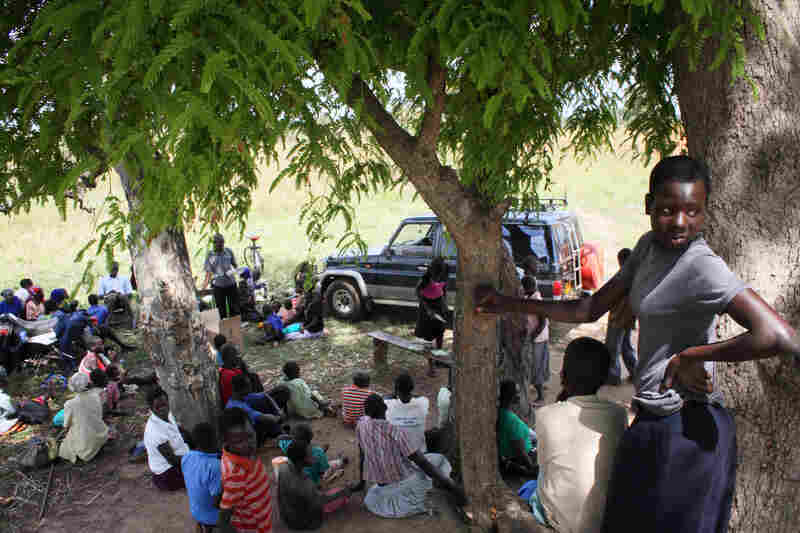 Parents and children gather at the outreach site in Pader. Twice a week, staff from the Atanga Health Center travel to various outreach sites to consult with parents and distribute a month's supply of sodium valproate. 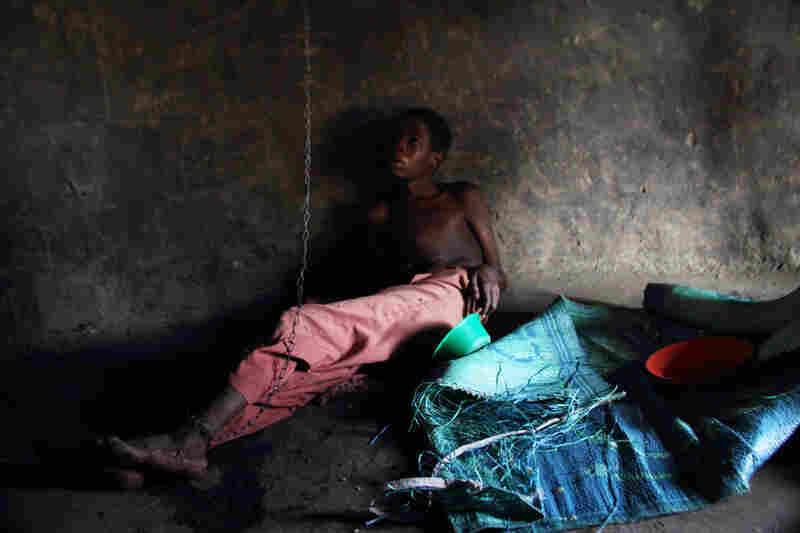 Robert Arima, 17, lies on the floor of his home in a village in Pader district. A chain runs from his ankle to the roof of the hut. Many parents can't afford to bring their children to a center that is equipped to treat nodding syndrome patients. Some parents, such as Robert's, tie or chain the child so they can continue to work, while ensuring the child won't wander off from the village. It starts with the nodding — otherwise normal children begin to nod their heads, pathologically. Then come the seizures. The children stop growing and stop talking. Ultimately, the disease wrecks the children, physically and mentally. 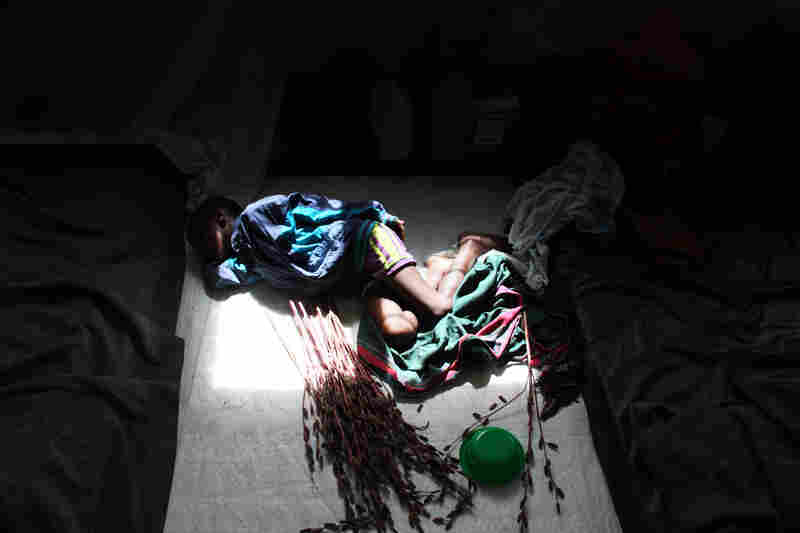 The strange and deadly illness known as nodding syndrome affects only children, and only in a small pocket of East Africa. 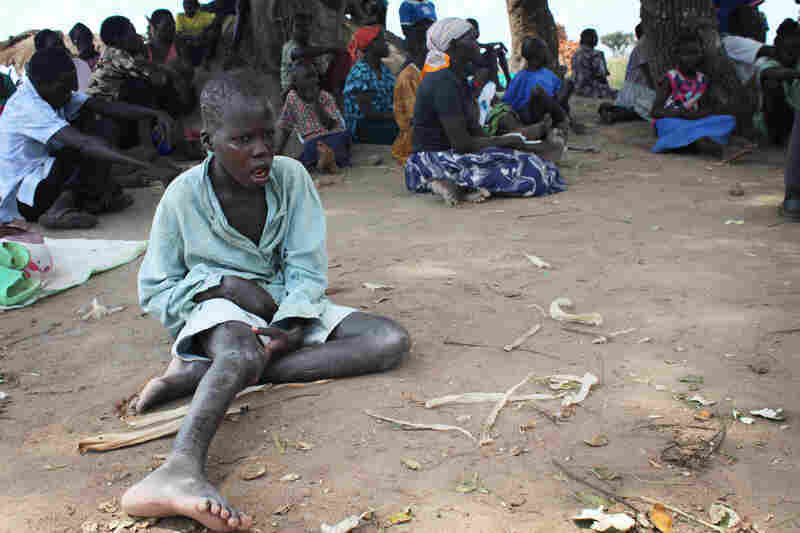 It has affected more than 3,000 children since the late 1990s, when it first appeared in what was then southern Sudan. And for more than three years, the cause of nodding syndrome has eluded epidemiologists around the globe. Investigators at the Centers for Disease Control in Prevention in Atlanta have made the syndrome among their top priorities on the short list of new, unexplained outbreaks. But as they, and others, continue to investigate the syndrome — figuring out its origin and how it spreads — much of the work trying to treat affected children has been left to Uganda. 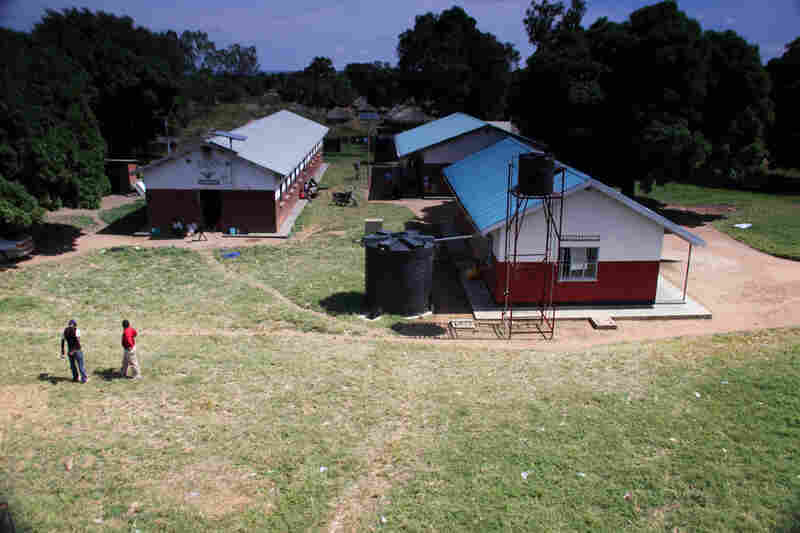 The nodding syndrome ward in the northern district of Pader, in Uganda, is a bleak place. Even a nurse here, Nicole Nyeko, will admit as much. "Because it's not really a ward," Nyeko says. "It's just somewhere where they have dumped these children." One of five that the Ministry of Health opened last summer in northern Uganda, the ward in Pader is a squat, one-story cement building. It's not spacious. It couldn't handle much more than the 11 mattresses, which sit directly on the ground, that run the length of the walls. Lamona Santiana sits on one of these mattresses. She came here a week ago with her grandson, Denis. Santiana says that for Denis, as with most children affected, it began with the pathological nodding of the head nearly a decade ago. He's 16 now, she says, but you can only get a glimpse of his age in his face – he looks half the size you'd expect him to be. He rarely moves. He hardly speaks. If he wants water, she says, he'll take a cup nearby and tap the cement floor with it. Most everything else is nonsense, hallucinations. "He's just in his own world," Nyeko says. This happens with children with nodding syndrome: They fall apart cognitively. And so what Nyeko and others hired by the Ministry of Health are trying to do is bring children like Denis back to some sort of normalcy, which is difficult to do here. Health care in Uganda isn't good. Less than one-third of the major health centers in the country are fully operational. Still, the Ugandan Ministry of Health carved out $1.4 million in its budget last year to mount a response to nodding syndrome. The ministry hired and trained physicians and nurses, like Nyeko. It bought big white vans, emblazoned with "Nodding Syndrome Response Team" in blue lettering. It also bought more than a million tablets of a generic anti-convulsant called sodium valproate, a drug that came on recommendation from the Centers for Disease Control and Prevention and the World Health Organization. The idea is that if you can begin to control the nodding — in other words, the seizure — then maybe you can start to return a child to normal. Workers get the drug to nearly all of the 3,000 affected Ugandan children by covering thousands of square miles of dirt roads. As of now, there aren't numbers, or at least nothing peer reviewed, to back up how well the drug is working, so instead you get anecdotes like Geoffrey Tabo. In a small village in Pader, Geoffrey sits cross-legged next to his father in a patch of grass, away from the crowd of parents and children who were still awaiting treatment. He says he doesn't remember much from when he was sick. His father fills in the blanks, describing how the nodding began three years ago. Over that time, he watched his son withdraw from friends and eventually stop talking all together. But, after six months on sodium valproate, Geoffrey can hold a conversation. He has returned to school. He's in the third grade and says he likes it. There are other stories like Geoffrey's. 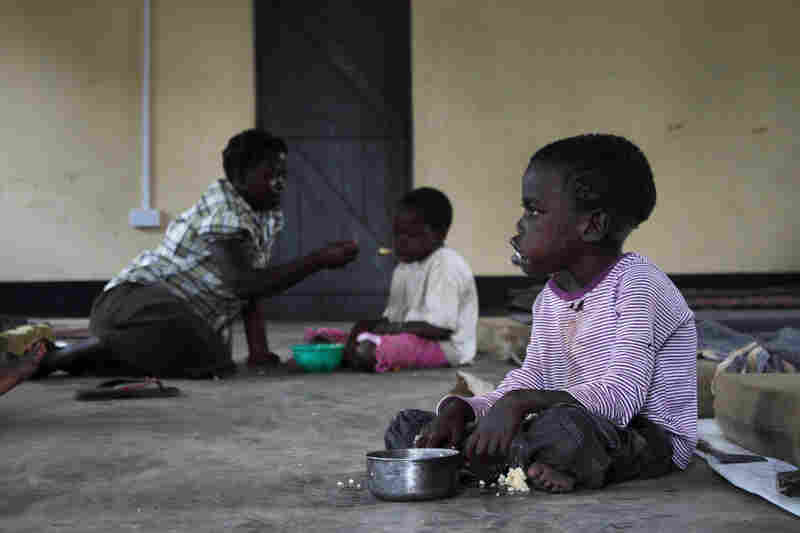 "Some of the worst affected ones couldn't feed themselves and now they're feeding themselves," says Robert Downing, a microbiologist at the CDC's campus in Entebbe, Uganda. "One of the ones I saw couldn't walk and now is walking." The CDC in Atlanta has spent hundreds of thousands of dollars and countless hours assisting the Ugandan government in investigating nodding syndrome. Among the possibilities explored is whether nodding syndrome could be caused by war-related chemical exposure, a response to a local parasite, or a vitamin deficiency or genetics. So far, investigators have hit dead ends. So, short of a cause, they're trying to treat a symptom. Sodium valproate has proved effective in treating seizures similar to nodding syndrome, which is why the CDC and the World Health Organization recommended the drug to the Ugandan government as a potential treatment. But Downing says that any anti-convulsant treatment is only one aspect of a response plan the CDC helped draft with the Ugandan government last year. There were also plans for re-education, nutrition, rehabilitation and more. But those programs were reliant on outside donors and have either withered up, gone unfunded or unimplemented. And nongovernmental organizations that champion nodding syndrome as a cause are few and far between, leaving families with children who might not nod as much, but are nowhere near normal. "So they do need help," Downing says. "And ..."
He lets out a heavy sigh. The outreach team in the district of Pader makes 27 house visits every month, going to see children one by one in some villages. At one home members visited recently, the parents were gone. Morris Oyo, lets us in. There, his brother, Robert, lies on the dirt floor, back against the clay wall, slowly eating rice from a bowl. A linked chain is wrapped around his ankle. It runs up to the roof, tied to a wooden beam. Morris tells me his brother has been nodding for 10 years. When it got bad, his parents took to tying him up in the hut so they could continue to work the fields. Most parents fear if their child is left alone, they might wander off, drown in a nearby well or fall into a fire. Morris says his parents can't afford to do anything else. After we walked out of the hut, a few from the response team told me they will often forcibly remove children from their homes if they think the child is neglected. I ask them if this constitutes neglect. They tell me no. This is just the reality of the situation. Matthew Kielty is an NPR Above the Fray fellow, sponsored by the John Alexander Project, dedicated to supporting young journalists and finding untold stories.